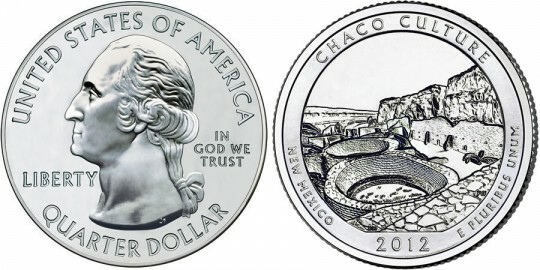 Appearing as the second of five 2012-dated issues of the US Mint's America the Beautiful Quarters® Program will be the 2012 Chaco Culture National Historical Park Quarter. Typically struck for circulation, the reverse of this coin will feature a design emblematic of Chaco Culture National Historical Park located in the state of New Mexico. The America the Beautiful Quarters Program debuted in 2010 and was authorized by the America's Beautiful National Parks Quarter Dollar Coin Act of 2008. Under the terms of the act, five new quarter dollars will be issued annually in the series until fifty-six new sites of national interest have been honored. One site was chosen from each state as well as the five US territories and the District of Columbia. Chaco Culture National Historical Park was originally established as a national monument on March 11, 1907 to protect one of the finest examples of ancient pueblo dwellings found in North America. The site became a national historical park on December 19, 1980 and today consists of a total of 33,977.8 protected acres. The inscriptions of UNITED STATES OF AMERICA, QUARTER DOLLAR, LIBERTY, IN GOD WE TRUST and the mintmark can all be found on the obverse of the coin. Each America the Beautiful related strike contains the same obverse portrait of George Washington. This portrait was designed by John Flanagan for use on the 1932 circulating quarter dollar and has been seen on the quarter, with minor variations, ever since. To honor Chaco Culture National Historical Park, a reverse emblematic of the site will be featured on the quarter. This reverse shows two elevated kivas that are part of the Chetro Ketl Complex as well as the north wall of Chetro Ketl and the north wall of the canyon. It was designed by AIP Master Designer Donna Weaver and sculpted by United States Mint Sculptor-Engraver Phebe Hemphill.